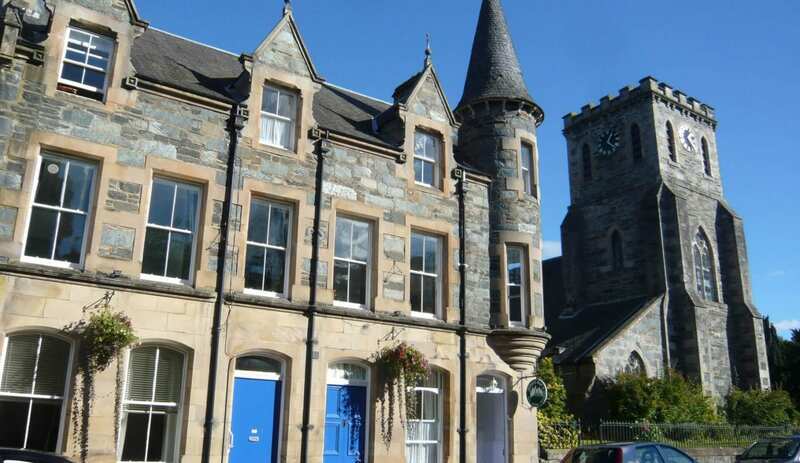 In the centre of Birnam just 10 minutes' walk from Dunkeld, this refurbished Victorian manse has 7 bedrooms and offers a mix of self-catering hostel and bed & breakfast accommodation. 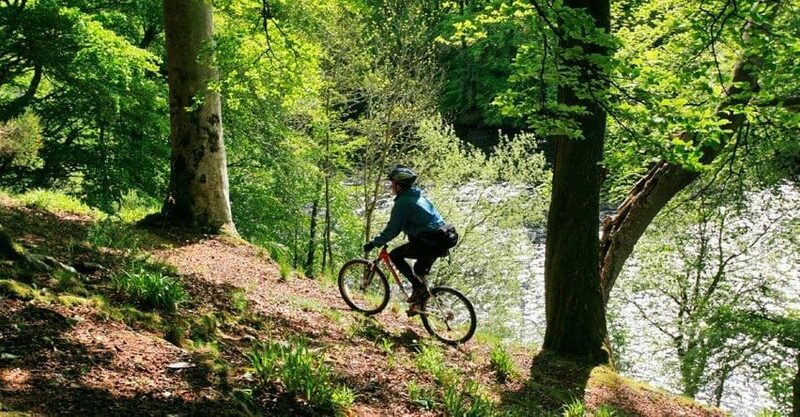 Tucked away in the forests of Perthshire the village of Birnam is a perfect base to discover the mountains, waters, rich culture and heritage of Big Tree Country. 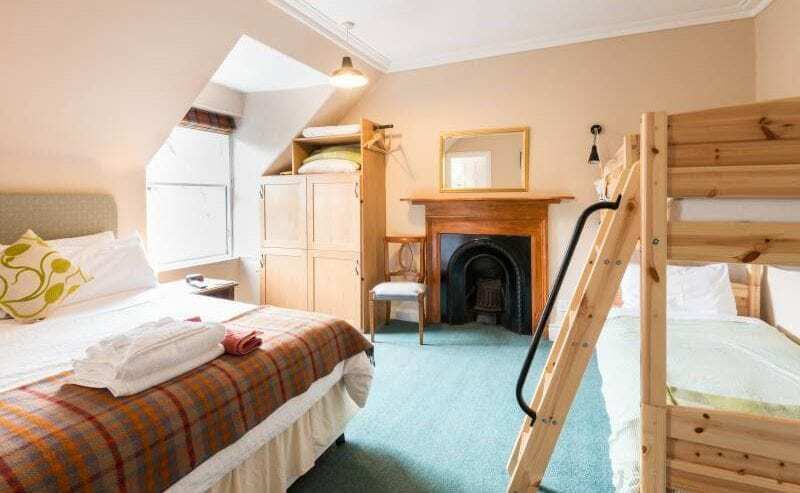 GTBS Gold award winning Jessie Mac's has private doubles, bunk rooms and family rooms, all en suite, offering a warm welcome and a good night's rest. The ground floor double room has wheelchair access. LGBT friendly and well behaved dogs are welcome by arrangement. An hour by car from Edinburgh and Glasgow with good public transport links. A great choice whether you're looking for an affordable hostel room to share with friends or prefer a private room to yourselves. This accommodation is featured on our map of the Cairngorms and Moray and here is its own website. Check in: 4pm - 6.30 pm. Check out: by 10.30am. Dorm £22pp +continental breakfast £27, +cooked breakfast £30. Double £29.50pp (based on 2 sharing) or £35 single occ. Child £11 in shared room. Infants free. Group rates available. Take Birnam/Dunkeld turning off the A9, Jessie Macs is in the centre of Birnam on the main Perth Road. Direct buses from Edinburgh/Inverness and connections from Glasgow. Direct trains from Edinburgh and Glasgow. Non car users are treated to a mug of tea/coffee, a bun and a fluffy towel on arrival!. This accommodation allows dogs by arrangement, is near mountains, is available to individuals, gives a Best Price Guarantee, is a Green Business Award Winner, has a pub within walking distance and is on the City, Backpacker and Boutique Hostels map. Nestled away below the Glencoe Mountain Range, amongst arguably some of the most picturesque landscapes in Scotland, lie the small towns of Dunkeld and Birnam. 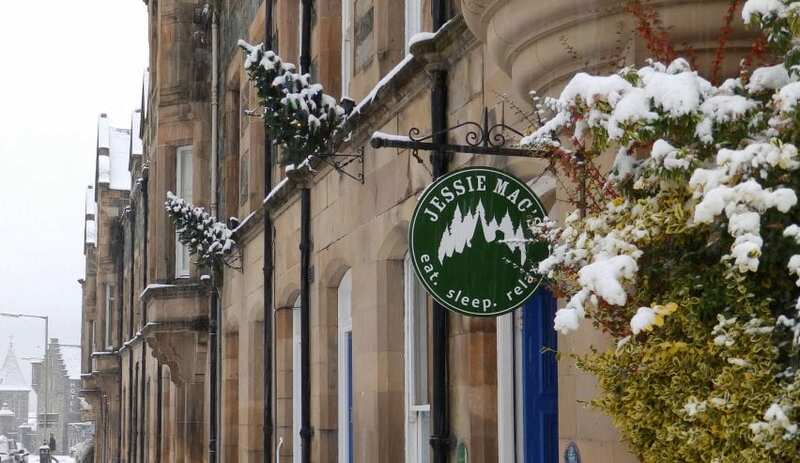 Book Direct at Jessie Macs in Birnam near Dunkeld, Scotland. 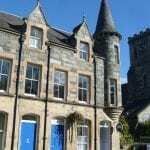 Book Direct to get the best prices for a bed in one of the lovely dorm rooms at Jessie Macs in Scotland. A perfect stop off location on a tour or as a base for exploring the southern Highlands. The Niel Gow festival is not far off! I have written elsewhere about how I think Jessie Mac’s near Dunkeld is the most charming and friendly hostel. I also mentioned that the gallery on their website showed a fair bit of ‘fiddling about’ going on! This might have something to do with the Niel Gow Music Festival on the weekend of March 17th – 18th. Named for the 18th century fiddle prodigy, the festival brings together violinists of all ages and from a range of backgrounds and styles. Check out the website and you’ll see lots of further information, but you can expect concerts, tuition, workshops and loads of enthusiasts. If you visit Jessie Mac’s Hostel in Birnam, near Dunkeld at other times you can still enjoy local traditional music. There is a live local music every Thursday night at the Taybank Inn in Dunkeld, less then 5 minutes walk from the hostel .